1. 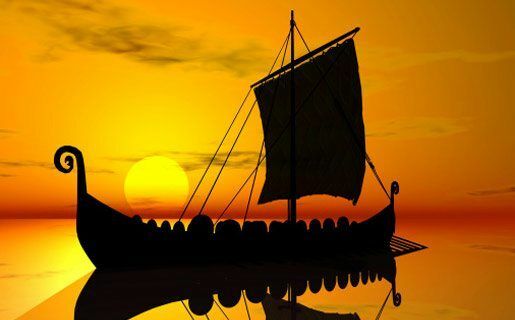 The Vikings were famous for sailing huge distances from their home in Scandinavia between AD 800 and 1066 to raid and plunder, but they also traded with people from other countries. 2. The name ‘Viking’ means ‘a pirate raid’ in the Old Norse language. Did you know that we have a FREE downloadable Vikings primary resource? Great for teachers, homeschoolers and parents alike! 3. Around 500 years before Christopher Columbus ‘discovered’ the American continent, Vikings had visited its shores, landing in what is now Canada in around AD 1000. 4. Among the many gods Vikings believed in were Thor, the god of thunder, and Loki, a cheeky mischief-maker who could shape-shift to become all different kinds of animals. What a beast! 5. The Vikings were expert boat builders and sailors. 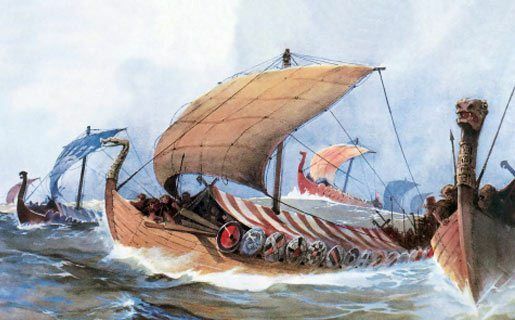 Keels – central spines along boats’ bottoms – made their 16 to 37m ‘longboats’ easy to steer, and because these were designed to float high in the water, landing on beaches was easy. 6. The Vikings were eco-pioneers – sort of! The ‘long houses’ where families lived would have turf roofs to help keep in the heat. 7. Fenrir Grayback, the werewolf in the Harry Potter books, was named after a ferocious giant wolf from ancient Viking mythology. 8. When important Vikings died, they would be placed with all their clothes, jewellery, even their animals, in a burial ship. This would either be covered with a huge mound of earth or set alight and pushed out to sea. 9. Bitter Scandinavian winters and frozen fjords didn’t stop the Vikings from tucking into their favourite food – fish! During warmer months they would hang up and dry fish to eat later. 10. Ever wondered where the word ‘berserk’ comes from? ‘Berserkers’ was the name of some terrifying Viking warriors who wore bear or wolf skins and howled in battle like wild animals! Check out this awesome video about the Vikings! What did you make of our fab facts about the Vikings? Let us know what you loved about them in a comment, below! Photos and illustrations © Getty Images UK. I'm doing a project on Vikings for school! Thank you for helping me with my viking project... I am making my own mini boat. Thank you for leaving good facts to help me with my heritage fair project . NHCHOR This is my first time go to see at here and i am genuinely happy to read all at single place. wow cool we should toats put this website onto Facebook!!! Awesome! I love the Vikings! Mia ros387e burrows __hi who are you? i love this website it was amazing! I go 10 ex creads for listing these 10 amazing facts about the "pirate raiders"
I got ex creads for list your 10 amazing facts about these "pirate raiders"
thank you soooooooooooo much now I wont get told of for not handing my work in at school youve been so helpful Thank you!!!!!!!!!!!!!!!!!! JtmCbM You have a good blog and I liked this post. I will be looking forward to your future posts. Keep up the good work. this app is awsam its got so meny facts! this website is super FUN with lots of facts! The information was not up to standard. I would suggest more facts and better content. If you are reading this website then go on the BBC, it is a better source of information. is there one about anglo saxons!and big cats!this sight is kool ! Im from Ireland I lived in Dublin for 10 years did u know that the name Dublin came from the Vikings!!!!!! amazing thanks for thge info! those were very interesting facts about the Vikings and I have a fact to the biggest discovered poo was done by a Viking. I have learnt that the VIKINGS were famous for sailing for a amount of time. Man who knew viking mentioned pirate raider. I think this is a great topic!!! love history and this is a great website great if you need to find out info about stuff! xldKNF I value the blog article.Really thank you! Cool. D8x9jk Im thankful for the blog post.Thanks Again. Fantastic. this was really good thanks!!! these viking fact were awesome. i learnt alot from them. These Interesting history facts about the vikings are AWESOME! i learnt alot form them. I love this website I collect the magazines as well GO NGC!!! thanks soo much Ilove this website!!!!!!!!!!!!!!!!!!!!!!!!!!! Am I the only one who can spell? informashon=information, fakts=facts, lol=why would you say that there is nothing funny!!! Thanks! Without this page I would not have been able to finish my school project! Thank you! I found my homework really easy thanks to this page!! This website is totes cool! amazing this helped me with my work so much! You helped with my homework so much. And it is fun ?? Brill facts! These are really useful as I am learning about Vikings! I really wanted to learn about the Vikings. WOW!!! The best info ever made about the Vikings. Funny thing is though.. that the old norse language adapted into other languages such as Norwegian, Danish, Swedish and Icelandic. However The Icelandic language hasnt changed much since then so us Icelanders can reed and understand the old stories which were written on old cows skin. All those strange words are surprisingly quite common in the Icelandic tounge. im only in year 1 and this website rocks!!! i had to do an assignment before i went to a party and this website helped a lot in life to me. Lol this website is so good on Vikings that I can study and do my homework. Really useful thanks so much! cool weird but true facts by the way, See ya! Really useful! Thanks for the help! This is really helping with my new topic "Vikings"
Really helped on my topic. Thanks! Thank you soo much for whoever wrote this article it helped me a lot!!!!!! This Helps with my SS Project at school!!!!! these facts are so facinating i might use for my homework if its history of course !!! These are brilliant facts about the Vikings , they helped me learn more. the facts didnt really help but helped a bit. Thanks anyways. Great facts! These facts really helped me out for a school project about Vikings! I didnt know lots about vikings and so did my mum ,dad,and sisters but now i have taught them a lot now they know a lot they have been telling all the work friends,teachers,cousins,relatives and neighbours .whoever made this website they are superstars even better flawless people!!! BEST WEBSITE EVER!!!! do any of you play animal jam? wow this is cool it made finish my homework and guess what I won a completion of this website !!!!!!!!!!!!!!!!!!!!!!!!!!!!!!!!!!!!!!! w0w! thys raly heelphed meh wit my homwark! fhankz! wow! Im learning on Vikings in school nice facts! thanks!! I love this website is so fun with fun facts!! Im definitely not lion about how good the viking facts are! I learned lots about the vikings and now I can do my project! YAY! So cool now I can Do my Homework!!!! these viking facts are totally COOL!!! Great! This helped out with my homework! Thanks so much N.G. Now I am ready for my Viking project! I really love this wedsite, because its safe for kids like me and it teaches me a lot of new things that I didnt know! IT HELPED ME LEARN A LOT IN OUR PROJECT I WAS THE BEST!!!!!!!!!!!!!! Hey this is a great site and it is really helping me with my year 8 work. The only issue I have is that my partner for the project wont do any of the work but I will just have to get the marks for the project for myself. I loved this information just what I was looking for!!! Thanks this site really helped me with my year 8 work and it is full of interesting facts if I do a project on vikings this is the site I will first go to. I found this website really helpful and interesting. I am now going to tell all my teachers and mates about this AMAZING website! the god thor was a real myth cool. i do love the vikings .One of the only reason im doing this is because it is my homework-ish . this help me so much thank u!!! GGGGGGRRRRRREEEEEEAAAAAATTTTTT !!!!!!!!!!!!!!!!! I LOVE IT !!!! I love learning about the vikings . I love this website it is so cool!!!!!!!!!!!! This website really help me alot with my project!!!!!!!!!!!! This Website is very useful! i had to use this website for a project and it was AWESOME! thanks this really helped me with my homework. I use this website a lot it is very useful. OK but not the best. Not epically helpful. I love this it has helped me so much. I never knew this before!!! ten facts of great information! Thank You for the help, It helped my friend so much!!!!! Thanks, it will help for my Grade 11 History course. This helped me a lot with my homework. Im learning about Vikings at school. Those were very interesting facts! Wow this really helped me with my home learning because I am learning about vikings at school. Thanks national geographic kids is my first source this helped me finish hw that was due tomorrow!!!!!!!!!!! this is soo good i had one day to do my homework and it helped me. good thing need i know this place because i need to do my homework! this really helped me in my homework. Cool! 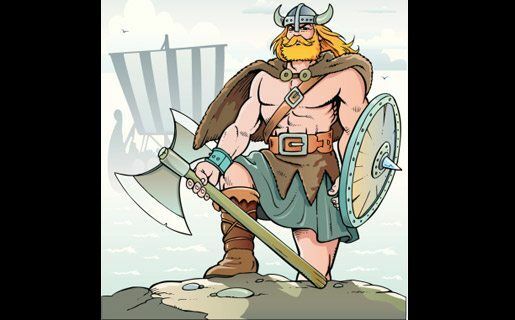 :-D There is one fact that you could included: Vikings did not wear horns on their helmets! OMG IT HAD SO MUCH HELP THANK BEST WEBSITE E-V-E-R EVER!!!!!!! It helped me with my home learning because we are learning about the Vikings after the Easter Holiday ! Yeah ! I LOVE THIS WEBSITE, VIKINGS AND YOUUUUUUUUUUUUUUUU NATIONAL GEOGRAPHIC KIDS!!!!! THANK FOR MAKING MY HOME WORK EASIER!!!!! This stuff really helped me! THIS STUFF IS AMAZING THANK YOU =)!!!!! We are learning about Vikings so COOL!!!!!! and making a Viking project so awesome. these are really good facts!!!!!!!!!!!!!!!!!!!!!!!!!!!!!!!!!!!!!!!!!!!!!!!!!!!!!! these viking facts are awsome!!!!!!!!! This is sooooo cool facts I just gonna tell everyone in the whole wide world about this website!!!!!! This is for my project and it really helped but I would really appreciate it if you wrote more maybe 20 or something like that but again thank you and may the troll be with you! this really helped me with my homework. IT REALLY IS AWSOME!!!!!!!!!!!!!!!!!!!!!!!!!!! Love this website it is so cool and awesome. Thnx. I never knew that, cool!!!!!!!!!!!!!!!!!!!! This is really helping me with my module homework. it was good for my society and enviroment because we did 20 facts about vikings!!! Thanks this really helped me! Wow, I did not know most of that info! I think all that imformation is very very intresting thanks to all you people everyone can learn about anything thanks. These facts are really good!!!! Im learning about Vikings in my class!! !